While pink diamonds are some of the rarest diamonds in the world, yellow diamonds are fairly common among diamonds that are colored naturally. This guide to buying yellow diamonds will help you decide the shade of yellow diamond that is best for your needs as well as whether you want one that is naturally colored or treated to gain its spectacular shading. When grading white diamonds, the scale moves from D, which is the most flawless diamond with no color whatsoever, to the designation of Z, which is when a white diamond has the introduction of a pale, yellowish tone. This tone isn’t usually visible to the naked eye. When white diamonds get into the realm of Z, the price decreases because as a white diamond, they aren’t as pure. 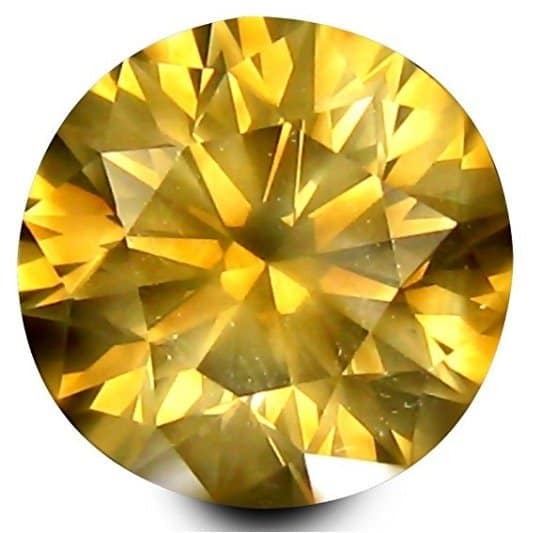 When the yellow tint is visible without magnification, it’s considered a pale yellow color, which moves the diamond into the category of colored diamond. It’s instantly more valuable than the degraded white diamond with the yellow tinge. Each colored diamond was exposed to a process while it was being formed that caused it to change from a white diamond to a colored one. For example, green diamonds were exposed to radiation that resulted in the coloring of the gem. When it comes to yellow diamonds, the color is due to nitrogen molecules that absorb blue light. 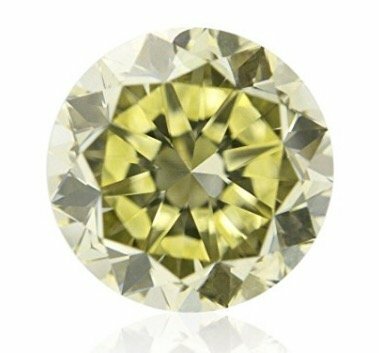 Since yellow diamonds fall off the white scale and onto the yellow scale for grading, it’s a bit different than other diamond colors. The color intensity normally moves from faint categories where the colors are considered very light. In most color diamond colors, it moves from Faint, Very Light and Light. After that, the colors move into the Fancy category, which covers Fancy Light, Fancy, Dark, Deep, Intense and Vivid. There are many angularjs development companines, but wich one you are perfer!? In the case of yellow diamonds, the grading is a bit different. When there’s a faint yellow tint to a diamond, it’s considered a white diamond with flaws. Those flaws put it on the lower end of the white diamond scale, so yellow diamonds are considered fancy only after they hit the designation of Fancy Light Yellow. Also, there’s no Pure Fancy Dark Yellow diamond without having a brown tint as a secondary color. 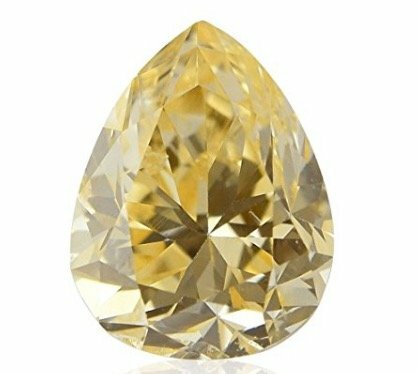 While a white diamond with flaws and tints of yellow wouldn’t be considered a good buy or value, a fancy light diamond with a bit more yellow in it would be recommended. 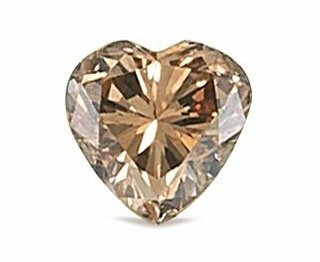 In many cases, the diamond will be a mixture of other colors like brown, green or orange. When there are more than one color in the diamond, the price is lowered significantly. This means that you can get more diamond for your money. If the secondary color of the diamond is one that’s sought-after like green or orange, and the intensity is higher, you’re looking at paying more for that diamond compared to one that is brown. You’ll have to decide what your budget can handle as well as how much diamond you want to buy. For example, you can spend thousands on pure Fancy yellow canary diamonds in stunning jewelry. 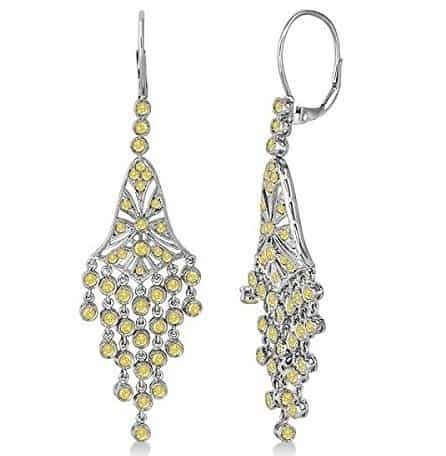 In total, there are over 82 fancy yellow canary diamonds in these bezel set, chandelier earrings totaling 2.27 carats. 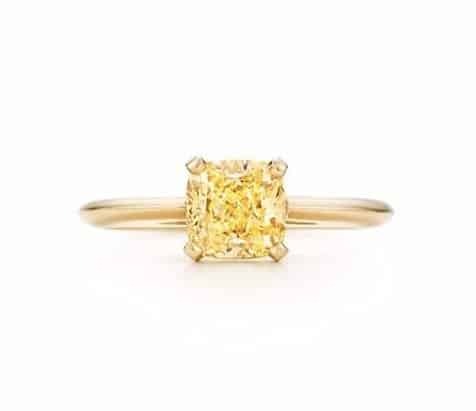 This Tiffany ring has one Fancy Intense yellow diamond, which has a carat weight of .18 and costs a few thousands dollars. If it equaled the carats of the earrings, it would have been approximately triple the price. When purchasing your yellow diamond, the intensity of the color, the carat and the setting can impact your budget. The cost of a treated diamond will be a lot less than the price of a natural diamond. Treated diamonds are ones that have been subjected to HPHT, High Pressure and High Temperature, or Irradiation. This can be used to introduce colors like green, brown or orange to yellow diamonds. In some cases, treated diamonds with tints of green can increase the price, but only if it’s natural. Treated diamonds are normally less than natural ones. There are many choices to consider when purchasing your yellow diamond. If you’re adding it to a piece of jewelry, you might pick a lighter color but enhance it with the setting. The basket color can boost the color of the stone itself. Even if you choose platinum or white gold for your ring, you can have it placed in a gold or rose-gold basket. The bright yellow will boost the color of your yellow diamond. It’s a great trick for when you want to boost your investment.